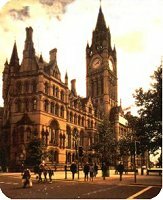 Hotels Of Manchester - the definitive guide on where to stay in Manchester, England - is the brainchild of the people who brought you Pride Of Manchester, the websites which celebrates life in the rock'n'goal capital of the world. We're also the same people who brought you ManchesterTheatres.com, ManchesterBars.com and Restaurants Of Manchester, together with other sites including Hotels Of Liverpool, Hotels Of Chester, StadiumHotels.com, Hotels Of Zurich, Hotels Of Geneva, Hotels Of Basel, Hotels Of Zermatt, Hotels For Europe and Hotels For Switzerland amongst many others. Noticing that there wasn't any other site on the Internet that listed Manchester hotels with any real local knowledge, the lads set about providing a guide to where best to stay in the region, depending on your reason for visiting. Are you coming to our wonderful city to watch the football? We can recommend the hotels nearest to the stadium. Are you coming to this hotbed of entertainment to watch a gig? We can tell you which hotels are nearest the MEN Arena or Apollo theatre. Are you planning a night out in some of the city's vibrant bars? We'll let you know which hotels are nearest the area you plan on partying in. Are you just staying overnight before you catch a flight from our award-winning airport? We'll let you know which are the nearest hotels, including those which provide long-stay parking. Are you visiting our city on a tight budget, or to the contrary, are you looking for somewhere exclusive to treat/impress your loved one? We'll give you all the information you need to book accommodation that matches your pocket. Are you staying in the region, but not necessarily Manchester itself? Or are you wanting to visit the beautiful surrounding countryside of The Lake District, The Peak District or The Yorkshire Dales? We can help out there too. Alternatively, complete the form below and Hotels Of Manchester will answer your enquiry as soon as possible by e-mail. All pages within PrideOfManchester.com, HotelsOfManchester.com and Hotels Of Manchester.co.uk are Copyright © 2002-04 Pride Of Manchester. All rights reserved. If you wish to reproduce any content please contact us first for permission - We don't bite! All information correct on 1st December 2004. Hotels Of Manchester can not be held responsible for any differences experienced at the hotel.